Get a new tablet or bring your own tablet and choose a data plan that fits your needs. 3 GB and 5 GB data plans are eligible for $5 OFF your monthly plan fee on a 2-year term. Prices for plans on a 2-year term. 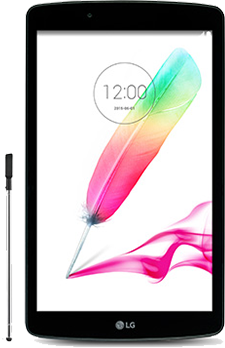 *$0 tablet offer applies on a 2-year 1 GB, 3 GB and 5 GB Tablet Data Plans. While quantities last and subject to change without notice. Some conditions apply, call for details. Tablet price: Device pricing varies by term and Tablet Data plan chosen. A minimum monthly Tablet Data rate plan applies. Alcatel A30 pricing on a 2-year term: $0 with a $40/month minimum tablet data plan; $0 with a $30/month or more minimum tablet data plan; $0 with a $20/month or more minimum tablet data plan. Tablet plans: Tablet Data plans are only available to existing wireless customers. Tablet Data plans are only available for tablets and cannot be added to your wireless cell phone service. Plans include data usage within Canada. $0.01/additional MB. Data charges while roaming: $1/MB in the U.S. Promotional discount of $5 off only applies to the monthly Tablet Data plan fee on a 2-year term. Cannot be combined with other offers. Some conditions apply, call for details. Bring your own tablet: Some conditions apply, call for details. Offer available to customers who bring in an unlocked tablet with new activation of service on any in-market standard Tablet Data plan. Credit of 10% applied each month, before taxes and applies only to monthly service fee of plan. Service term not required. Bring Your Own Tablet is not eligible with Welcome Price or additional discount. Cannot be combined with other offers. 30-day money back guarantee: You may return Equipment purchased from Cityfone within 30 days from the date of activation of the Equipment to us as long as you return it to us in complete and original condition and you have not used more than your plan’s monthly voice, text and data usage limits. Cityfone will refund you the purchase price for the returned Equipment and will not charge you any early cancellation fee, provided that you return the Equipment in its original condition, together with all accessories, manuals and packaging. If your Equipment is not returned in its complete and original condition or any accessories, manuals or packaging are missing or damaged, Cityfone may, at its discretion, still accept the return of your Equipment. However, we may charge a replacement fee for any of the missing or damaged items. A list of these fees is available on the Charges and Service Fees page. You will be billed for all charges incurred up to the cancellation date. After 30 days, you will be responsible for an early cancellation fee equal to the device subsidy multiplied by the number of months remaining in your contract term divided by the total number of months of your term (plus applicable taxes). Bring Your Own Tablet and get 10% OFF your Tablet data plan monthly service fee! LTE, or "Long Term Evolution", is the global gold standard in wireless network technology. Far superior to previous technologies such as 3G and 4G HSPA+, LTE delivers a faster, richer and smoother wireless internet experience than ever before. Easily download large files and upload to cloud storage, stream high-definition movies and video conference lag-free, plus play advanced online games and apps. Built to handle more users doing more complex things, LTE allows you to stay connected on your wireless device in ways you've only imagined. Do I receive a warranty with my new device?